In 1941 Virginia Woolf loaded her pockets with stones and walked into the River Ouse near her Sussex home. Her suicide, both tragic and shocking even to a nation in the turmoil of the Second World War, moved hundreds of people to send their condolences to her husband, Leonard, and her sister Vanessa Bell. Now for the first time these personal and often intimate letters, stored in the Special Collections of the University of Sussex's Library for more than 30 years, have been published. They include messages from eminent intellectuals and writers of the time, such as E. M Forster, H.G. Wells and T.S. Eliot, as well as students, reformers, refugees, devoted readers and the Woolfs' close circle of Sussex friends and relatives. 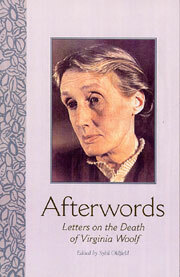 Afterwords, Letters on the Death of Virginia Woolf (Edinburgh University Press, £17.99) is edited by Sybil Oldfield, a Research Reader in English at the University of Sussex, who spent five years tracing the writers and their surviving relatives to seek permission to publish as many as possible of the 250 letters in full. "This is the end of the story of her life, but the letters also give us a fresh perspective on what was thought about Virginia Woolf by her contemporaries, especially her personal relationships," says Oldfield. "During her life she was accused of being aloof and sarcastic, but it is obvious from many of these letters that people felt supported by her and sensitively understood." Her childhood housekeeper Sophie Farrell, who was living at Sharpstone in Sussex., wrote: "She was always so sweet and good to me, I could never forget her." Her former lover, the writer Vita Sackville-West described "a loss that can never diminish." Her Brighton doctor, Octavia Wilberforce, was deeply affected by the news. "It was such an unforgettable joy to be with her and feel the brilliance of her mind." But the announcement of Woolf's suicide in The Times also fuelled an attack on her "cowardice". As Oldfield's introduction explains, Leonard Woolf knew that his wife took her own life because she feared an incurable attack of the depressive illness that had dogged her life. Unfortunately, the reference in her suicide note to "those terrible times", meaning her bouts of insanity, were misquoted by the Press as "these terrible times", meaning the War, and triggered some unsympathetic reactions from those who thought she was wrong to take her own life while others were fighting for their country. The novelist H. E. Bates wished people had not taken her seriously, writing "one raspberry of honest derision would have been salutary." Oldfield, who has written many essays on Woolf and has been invited to give the Virginia Woolf Birthday Lecture in Janaury 2006, hopes that Afterwords will serve as a revealing, many-sided tribute to the life and death of one of the most extraordinary intellectuals of the 20th Century.